Micro-libraries are springing up all over and on Beach Drive, we have at least two (please let us know if we’re missing any)! 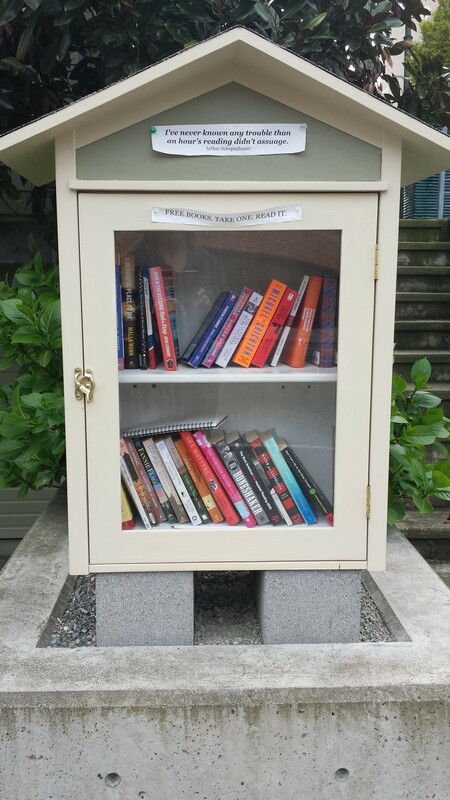 These private mini-libraries offer free books and often encourage the community to borrower a book and perhaps, leave or donate a book. Each micro-library has their own unique design and personality. This is the first micro-library that I noticed on Beach Drive. It’s located by 4171 Beach Drive. 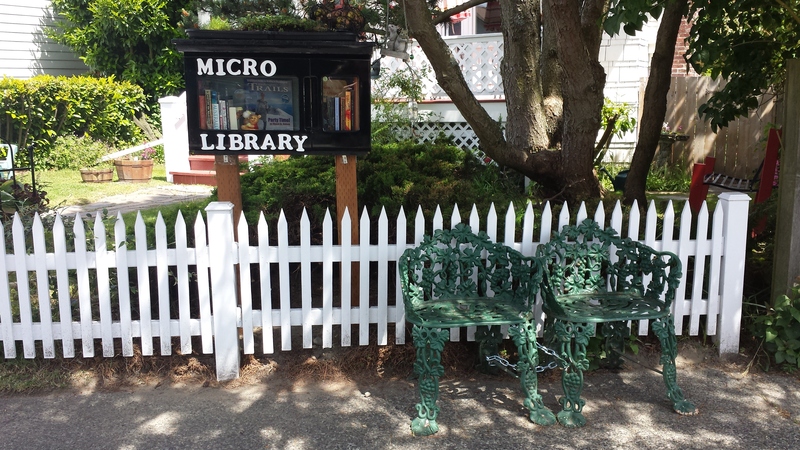 This micro-library is located at 4710 Beach Drive, features a mini-garden along with a couple of chairs to relax in, should you decide to start reading there. Want to find other micro-libraries in your area? Check out http://littlefreelibrary.org which features an interactive map. 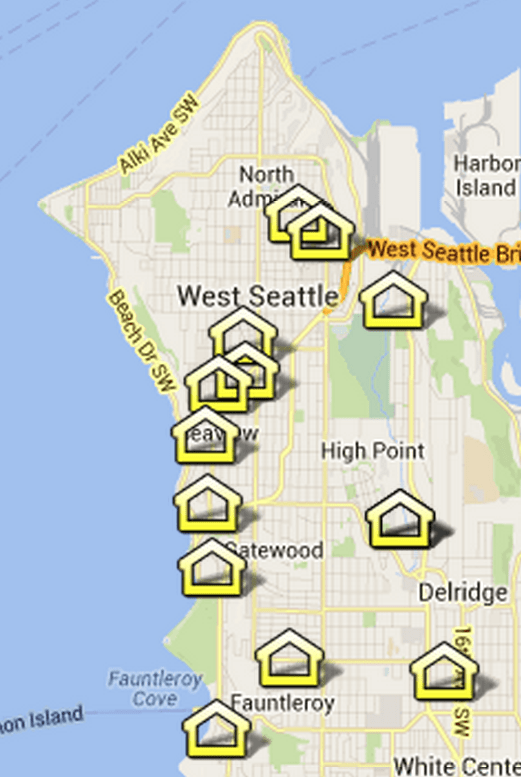 I wasn’t able to locate our Beach Drive libraries on the map – however, you’ll notice there are several others located in West Seattle. Joan Hockaday, author of Greenscapes, Olmsted's Pacific Northwest, which WSU Press has published this spring, will talk about the influence of John Charles Olmsted on West Seattle, particularly his friendship with Ferdinand Schmitz whose land became Schmitz Park and Me-Kwa-Mooks Park. The talk is Tuesday June 2nd at 7 p.m. at the Log House Museum, 3003 61st Ave. S.W., sponsored by the Southwest Seattle Historical Society. Contact the museum for more information: 206-938-5293 or loghousemuseum@comcast.net. The talk is free; books will be available. TONIGHT…SW WIND 25 TO 35 KT BECOMING N 10 TO 20 KT NORTH PART AT TIMES. WIND DIMINISHING LATE TONIGHT. WIND WAVES 4 TO 6 FT EASING TO 2 FT LATE. SHOWERS AND A CHANCE OF THUNDERSTORMS. My first report from the Marine Forecast was that the gale warning would last until 11 tonight (just prior to our high tide of 11:21 pm). In light of how nasty this has been and that the wind and waves are still going strong, I think this justifies a "barking dog" report. REST OF TONIGHT…WINDY. SHOWERS THIS EVENING…THEN NUMEROUS SHOWERS AFTER MIDNIGHT. LOWS IN THE 40S. SOUTHWEST WIND 20 TO 30 MPH WITH GUSTS TO 40 MPH THIS EVENING…DECREASING TO 10 TO 20 MPH AFTER MIDNIGHT. To be on the "safe side" we are dragging out our pumps and preparing for worse case scenario. What are you doing?